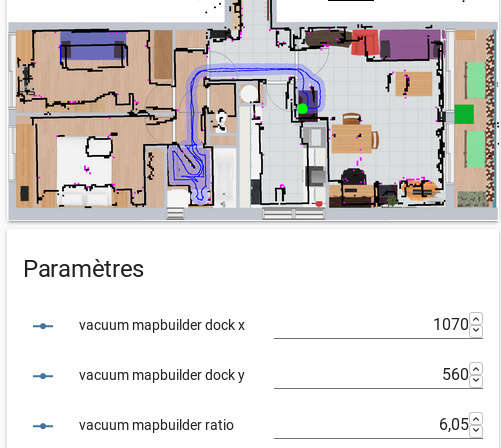 I made an AppDaemon app that manage to build the live map of a Xiaomi vacuum cleaner with the floor plan as a background. I’ve made it so that it does not requires anything installed on the vacuum except the SSH key (rooted). It’s adaptable as it’s based on input numbers to position the vacuum dock on your floor plan and also to define the ratio of upscaling of the vacuum plan to match the size of the backgroung image. Contribute to pheuzoune/ha_xiaomi_vacuum_map development by creating an account on GitHub. Does this still work with the newer FW Versions? 1633, 1780 etc? Mine is on 1810, latest firmware available. Exactly why I developped that. I didn’t want anything other than ssh key installed on my vacuum. Where did you get that firmware? I’m actually looking for the latest to Gen1 (i.e. 3466) but I cannot find that, so any leads in the right direction is appreciated! I’ve looked through the dustcloud mirrors (i.e. https://dustcloud.seemoo.de/public/xiaomi.vacuum.gen1/ and https://dustcloud.seemoo.de/public/xiaomi.vacuum.gen2/) and tried concocting links to Xiaomi (i.e. like https://cdn.awsbj0.fds.api.mi-img.com/updpkg/v11_003466.pkg) but no luck so far. The URL need to be built depending on the release, and as explained on dustcloud github, not all servers have all the releases. This URL is built with awsbj0 server.